Any of the op. 18 quartets should be pretty enjoyable without excess head-scratching. They're all wonderful, of course. Listen to the catchy scherzo of op. 59 no. 2 in E minor with the dancing rhythms, plus a Russian tune in the trio, the same on used by Mussorgsky in the Coronation Scene from Boris. The "Harp" Quartet, op. 74, in E flat, is a beauty. The 'untrained' ear would probably get along most with the string quartets from Beethoven's early and middle periods, from op.74 and back (or maybe op.95 and back). The late quartets starting from op.127 perhaps don't have quite the mass appeal of the earlier quartets - not because quality is lacking but because Beethoven has turned in on himself and brought much more introspection to the works. There isn't quite the visceral thrill as in the earlier quartets, no real overt displays of 'heroism', so some people defer to the earlier ones because of this. The late quartets though will no doubt grow on you as your ear 'develops'. Bet on it. Yes, I agree with the above. My introduction to them was through a set of the middle period ones. There were on Phillips by the Quartet Italiano; I still prize them highly. Unfortunately the quartet no longer exists; they disbanded for political reasons. That is the only time I have known of that happening. However, they left behind them quite a few very beautiful recordings. I would think the Quartetto serioso (op.95) to be the most easily accessible or, better, the most effortlessly enjoyable. At least, that's the first one I heard and I loved it instantly whereas I'm still rather casual with the Rasumovsky lot (op.59). Tasos, you pre-empted me - op. 95 is an excellent choice, a perfect work. It gripped me too from the moment go. From the late quartets op. 135 is very accessible, imo. The ones I first fell in love with were 59/3, 59/2, 74 and 18/4. The Quartetto Italiano middle-period quartets were, interestingly enough, my introduction to the quartets. In fact, I have gone QI when I've wanted to branch out into the early and late quartets. My first Beethoven Quartet was Opus 18 #4. After that one I was hooked for life. Any of the op. 18 quartets should be pretty enjoyable without excess head-scratching. I'd certainly concur with this. These were where I began with Beethoven's string quartets, and they served as an appropriately gentle introduction to his compositions in this form. Everyone is different. My first quartet was op. 132, which I loved immediately (minus the second movement, which I still find boring, the Trio excepted). It's Beethoven, for crying out loud! Personally, I've never had "accessibility issues" with any of Beethoven's compositions I've heard so far. (Okay, the last movement of Op. 130 apart.) If anything, it was only the appreciation that grew with each listen. Never had a problem with Beethoven either, aside for the usual suspects (Hammerklavier, Grosse Fugue), which took some time to crack. I recommend starting from the early compositions anyway. It's a fascinating experience to go from his early classical period to the incomparable genius of his late works. Yep, 1-11 are all easy enough to get into. I also was introduced to Beethoven's SQs via the Italians, surprisingly enough it didn't scar me for life. Nah I'm playing, I agree with you middle quartets. The early ones are good, but the middle ones are fiery. Gee, thanks a lot for your replies! It seems that there are many ways of approaching these magnificent works. My love towards these works began with op. 130, not with the most complex movements, but with the Presto (2nd) and Alla danza tedesca (4th). The rest of the exploration was backwards through time: after the late quartets, the middle ones, and ending by op. 18. Now I'm listening to the Cavatina of op. 130. It's almost superfluous to say, but... what a magnificent music. I started with op. 59, 1 Borodin String Quartet. It took three listens, then I was "converted" into a hopeless zealot. 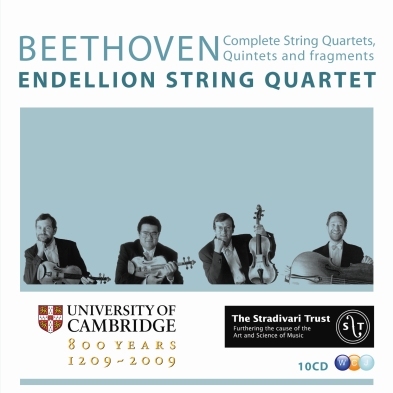 I'd buy the new Endellion String Quartet box set before the Italiano. The Endellions are more direct in their communication, whereas the Italiano are softer, less Beethoven the way I understand him. They also use the latest corrected edition of Beethoven's scores. Also, you get more music with Endellion: The 1799 version of op. 18/1, the H34, the string quintets, some short pieces and fragments. Why a box set? Because it's cheap and it will be your reference for the rest of your life. Where to start? Op. 18 (all six), 59/1, 74, and 135 (es muss sein...) should be mighty fine. Op. 95 is a little brute or a little softie, depending on who's playing, so I cannot really recommend it as a starter. But if you have a need for speed try the Hagen Quartett and get the best Schubert D887 I've heard at the same time. The Endellion set is availabe at Amazon whereas the Hagen disc is on ArkivMusic or available as mp3@320kbps from Deutsche Grammophon. Is that the 12" remix? To the OP: I recommend going into itunes (or some other site where you like to sample music), typing in a specific movement to a specific quartet and listening to the sample of as many different interpretations as you can. Narrow your choices to say a half dozen, then try another SQ, continuing in this fashion until you have zeroed in on some QTs that seem accessible to you. To me, if one finds a SQ accessible, then one should be able to discern this from listening samples. Like others have suggested, I think you will find that many (if not all) of the quartets leading up and including the Op. 95, are quite accessible. You can buy all of the early quartets or middle ones (or late for that matter) for some quartets, but not all. Like Valentino, I think a complete set is your best way to go, if not for just economic reasons. Good luck!